The demo release went really well. There weren't many critical bugs this time, and people liked the new material. Still, some details needed to be improved. Some bugs needed to be fixed. So, after a very intensive month of development, here's a Demo Update. The Speed Booster had a nice revamp. It feels more solid and more versatile than ever. There are plenty of small details and improvements. There are still some bugs that involve slowdown and crashes on very specific hardware setups. A future update might include workarounds to make the game playable on those scenarios. As always, have fun and share your experiences, thoughts and opinions by commenting here or at the Forums. Aw yeah! The new Speed Booster feels incredibly solid now and it's good to see that the Factory received the custom tileset it deserves. Can't wait until it's finished! Keep it up Doc! The mediafire link is broken Doc. Great Game, I've never played the original but this game is awesome! Nintendo should allow this game in the E-shop hahaha. Anyways the Demo worked great. My opinion is that the game is really challenging, but at the same time fair and gives you the tools to work around. There was one area in particular I thought that It felt it was too early for me to approach because I thought game designer wouldn't put scrubbies through all that effort in order to enter lol. Its the area where you have to bomb jump and there is a spike wall to the left, The entrance to the Breeding Facility. One question I have is, once the game is completed will I have to start a new game or will this save file I currently have work? Been following your project for awhile now, and was excited to try this demo. I don't know what's going on, but as soon as I move to the second screen, the entire game starts stuttering, video and sound and it becomes unplayable. I have a computer able to run just about anything. Any ideas what's going on? any word on a completed game release? no rush, just curious. thanks for the update doc. this game is really starting to come together now. I enjoy playing it more now that the speed booster has been added to the demo. Looks like my computer is one of the hardware setups that still suffers the slowdown. The surface and first room into the caverns run smooth as butter, but the game slows afterwards and seems to get increasingly slower as going deeper in. I have went ahead and tried this, really damn good job. At least you rectified that one Speed Booster glitch where you may hit a missile barrier during the run and just "run frozen" until braking. (I have that one groanworthy issue of running on an analogue stick, but not being able to kneel). Great to see a new release! Thanks for all of your hard work. I'm curious, is there any chance you'll be releasing your dev tools for public use? For anyone wanting to take a crack at making a Metroid game, I would imagine an engine that can stand on its own and is customizable from the beginning would be highly preferable to hacking ROMs. Ah, you surprised me good with that alpha to gamma mutation sequence. Just when I thought it was safe to play through the old areas, you still managed to startle me. Very nice. Consider adding that mutation sequence to a couple other gammas. It would be a shame to have it only happen once. I love this game. I just beat it with 91% of the items. I can't wait until It's finished. The only downside is the stuttering issues others have also experienced. The game started of very smooth and the stuttering became more frequent as I progressed through the game. I have 4 GB of ram and an Intel core 2 duo CPU P7350 @ 2.00GHz. I'm running Windows Vista 64-bit OS. I'll be sure to let others know about this awesome game. Thanks. anyone else get a message after downloading that says am2r_demo131.zip is malicious,and chrome has blocked it.? It pains me every time I see a demo update, because I so want to play and record it, but I made a promise to not touch it till it's finished. Doc M you're killing me here! But I'm so glad the project is still going strong. Just finished on normal with 79% and had an absolutely fantastic time! As has been said before (I wouldn't spoil it if it hadn't been already) the transformation sequence was a nice surprise. I'm hoping I can hold out on playing any future releases until the game is finished, just so I wont be killing myself replaying the whole game every time there's a new release. Anyway, fantastic job! Has anyone managed to steal the Space Jump from the Torizo that guards it? I decided to try it on a Hard run with this update. Picked up the Speed Booster first. Didn't manage to escape fast enough. Has anyone gotten lucky? Also, if it is possible, DoctorM64, DON'T remove it from the finished game at all. - In original M2 game, there was a cave between Main Caves and Hydro Station in which there were some big flies that drag you into the sand. - I remeber that in lava part of the Mining Caves there were those pink things that jump out of lava, just huge. - Maybe you could add some more hidden missiles, super missiles or E-tanks that require certain upgrade which you must collect in another area, for example, there's a missile tank in area 0, and to get it, you must get the bombs in area 1. - In jungle part of area 3, there were some flashing eneimes in original game. Thank you for this amazing game, and keep up the good work. Really good demo. I do have some things to say though. -There seems to be an issue with going diagonally up walls; it was noticeable in the large room before Arachnus. -Speaking of Arachnus, he's still WAY TOO STRONG. He needs a serious nerf, the speed and damage of his attacks are incredibly difficult to avoid and far too punishing so early in the game. Man, I love just turning on this game, and playing around with the Speed Booster alone for hours on end. It's so fluent and I especially love how you incorporated the Machball/Mochball thing from Super Metroid (though I'm a little sad that unmorphing has a cool-down on it now, say good-bye to feeling like a TAS). This game is beautiful, and deserves all of the praise it has been receiving. I can't wait to see this game when it is complete. Hi Doc, just read about your game this weekend, downloaded it, and played it through. Soooo impressed. I'm a big Metroid fan, and this felt just like the others in the series. Well done. I moved my House and i got tons of stuff to do. On my Machine the Demo has a Sound Problem, i plays Music but no SFX. Strange im using a Asus xonar DS. can you transfer save data from the previous version to this one? This game has always looked absolutely stunning, and this new demo continues to blow me away with every new surprise (Loved the space jump boss, by the way! Didn't expect that one, as well as the new boss in the corridor on the way back from the first area) I was playing on Normal, and found the game to overall be considerably difficult. I had a lot of trouble fighting the Metroids (Alpha and Gamma, maybe I'm just bad?) I particularly found myself trying to use the diagonal arm button, but my keyboard wouldn't let me do that (that's actually my own hardware issue, but I should mention that anyway) The game's intro made me feel like I was immediately "jumping into the action" with little explanation, though I suppose the original game also did that. I didn't mind it, being used to the Metroid physics from past games, but I do feel it might be a problem to some newcomers. I was actually hoping there'd be some short intro cutscene, similar to what Zero Mission did. By the way, great job with the sound design! I noticed that the game engine uses a echo/reverb engine in realtime with some really cool panning effects. The soundtrack felt rather "badass" like Metroid Prime, and I was delighted to hear remixes from Super Metroid and Metroid Prime 2 (Or am I mistaken?) I really liked the full-ambient tracks as well. I think they captured the mood of each area very well, the same way Metroid Prime did. I should mention, however, that I felt the orchestra strings for the "Game Load" and "Item Obtained" fanfares should have layered strings an octave lower the ones already there (maybe a cello or something in the baritone?) to make the orchestra feel more "full". Thanks for taking the time to read my rambling, and I look forward to future updates on the game! 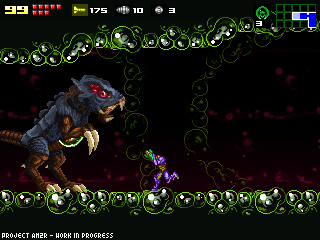 Hey man it´s the best demo ever but i have doubts, is there gonna be more enemies in further demos or in the official game because I felt it a little empty, Torizo boss is a little strange comparing it with the Zero Mission and Super Metroid ones. I meant to add that, time permitting, you should add additional Alpha Metroids bursting from their larval husk where they'd fit in artistically. A good second time to witness this transformation would be in the Hydro Station zone, the Alpha just before the wave beam power-up. Also, if I recall correctly, in the original game, there were spikes put along the walls in the area where Samus acquires Space Jump in an effort to guide you to find it. In the giant cave at the start of Area 3, it's possible to spider ball on the ceiling over the entire area. I feel like there ought to be ceiling spikes in order to encourage the player to find Torizo while leaving the skilled players to infinite bomb jump over the spike-lined wall. Amazing work doc. This is my first time playing a demo since confrontation. i have been waiting until i got a controller, and now that i have one i can say your game is amazing! i have been itching for another 2d metroid for awhile, this scratches it! And something i was thinking about, on the surface of SR388, it's sunny out, however when i played the original, it always looked like it was night. Just an idea, but you could change the time of day as the player is coming back to the surface with the hatchling. Can you make the individual Beams sound different? If you pay close attention, a charged Wave Beam, with or without the Long Beam, sounds different without any other Beams combined with it. Downloaded this yesterday and on my first playthrough I was wall jumping, bomb jumping and overall sequence breaking like a boss! SO glad to see that the sequence breaking aspect of metroid is still present! I hope it's not too late in your development process to make a suggestion: Near the end of the game, when the Queen releases little Metroids to try to prevent you from reaching her, it would be fun if those Metroids could be released not only around the Queen's lair, but in ALL the areas of the game, which implies that Samus would have to backtrack through all the areas to hunt down and kill those 'baby' Metroids the classic way (with the Ice Beam and 5 missiles). Finally, a quick question: The 'About the Project' section of the official AM2R web site mentions that there will be 'new areas'. Will these new areas be completely new and distinct, or just extensions to the main areas already established in the Game Boy game? I for one would love to visit an underwater area similar to Maridia (where the Gravity Suit would be helpful) or an ice-covered area, or a lava area deeper inside SR388. I myself was also wondering that, do I have to start a new game or can I just use the save I used for 1.34?